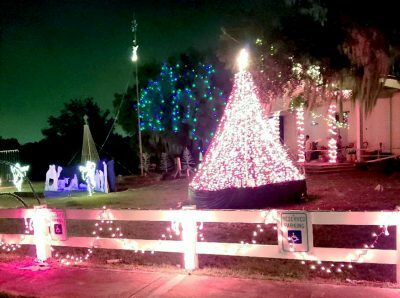 The Masonic Park and Youth Camp in Wimauma will host a Christmas lights extravaganza now through Dec. 31 at 18050 U.S. 301 S, Wimauma. It will feature about 300,000 lights and a choreographed light show that will include more than 20 selections of Christmas music, leaping arches, a light wall, two mega-trees, artificial snow machines and more. The 204-acre park is managed by a nonprofit board and is open to the public. Tis the season for Christmas concerts and few singers will put in more time spreading the cheer this month than the singers from Riverview High School’s Choral Department, performing 20 public and private concerts. The school is also debuting a new Victorian Choir ensemble, performing songs that Charles Dickens might have heard. Riverview’s Chorus includes Harmonix, a vocal a cappella ensemble, Vision, a mixed show choir, a Chamber Choir, a Mixed Choir and Women’s Choir. • Monday, Dec. 24: Christmas Eve Services at Bell Shoals Baptist Church–Apollo Beach, 408 Apollo Beach Blvd., Apollo Beach, with performances at 3 and 5 p.m.
It’s the most wonderful time of the year as ZooTampa at Lowry Park, 101 W. Sligh Ave., Tampa, transforms into a world of holiday cheer for “Christmas in the Wild.” Families will experience a memorable evening with the sights of thousands of twinkling lights, seasonal holiday treats and refreshments, to the wonder and enchantment of wildlife at night. 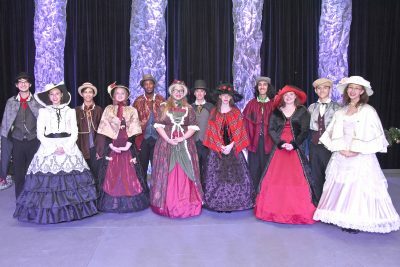 Enjoy carolers dressed in Dickens-era costumes and story time with Mrs. Claus. Guests will be mesmerized by a 50-foot animated Christmas tree complete with 12,000 dancing lights, 2,000 ornaments and an 8-foot star. The popular “A Present for Hazel,” a holiday-themed animal show, returns featuring famous animal ambassadors. Visiting Santa in his workshop is included with the event. Other holiday-themed areas include Holiday Hoedown, Polar Paradise and Candy Cane Lane. Christmas in the Wild takes place select nights: Dec. 14 through 16, 20 through 23, and 26 through 30 after 4 p.m. Tickets are $24.95. For more information, visit www.zootampa.org. The Southshore Concert Band will present a concert titled “Holiday Cheer” on Monday, Dec, 17, at 7 p.m. at South Shore United Church of Christ, 1501 La Jolla Ave. in Sun City Center. The concert will include Yule time favorites and four new holiday songs not performed by the band previously. Enjoy the works of many different concert band arrangers. You can preview the sound of their 55 member ensemble at www.southshoreconcertband.org. The concert is open to the public and a free will offering will be taken. Sun City Center United Methodist Church, 1210 W. Del Webb Blvd., Sun City Center, is pleased to announce its annual “Sights and Sounds of Christmas,” on Wednesday, Dec. 19, at 5 and 7:30 p.m. This free event is a gift to the community and it has become a highly anticipated offering of a variety of Christmas music featuring the children, youth, bell choirs, soloists, dancers, and choral and instrumental ensembles from their Anglo and Hispanic congregations. This year, their new organ will also be featured as part of the musical presentation. This magical evening of light and sound also includes a dramatic re-telling of the Christmas Story to remind you of the greatest gift: Our Lord and Savior Jesus Christ. Although the event is free, space is limited. Free tickets may be picked up in the church office now for the community and on Saturday, Dec. 8, for the congregation. For more information, call Director of Ministries Pat Hill,at 813-634-2539, ext. 209. Join us for a time of Worship and Celebration at the Apollo Beach Nature Preserve. 4 to 5 p.m. The park is at 6760 Surfside Blvd, Apollo Beach, FL 33572. Enjoy a real snow play area for kids at The Florida Aquarium, 701 Channelside Dr., Tampa, Dec. 26 through 31 from noon to 5 p.m. The aquarium will be open during regular business hours 9:30 a.m. to 5 p.m. Access to the snow play area is included with general admission. Children with sensory differences and their families can enjoy all of the Snow Days fun in a low-stress environment. 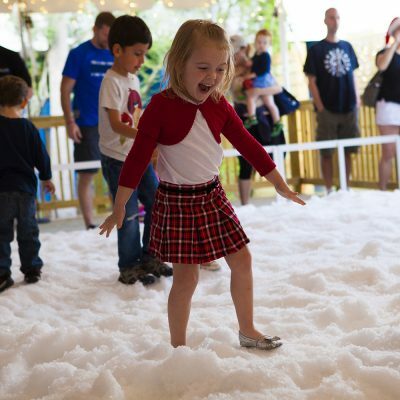 Join them for a Sensory Snow Day on Dec. 29 from 10:30 a.m. to noon. Sensory headphones are available at Guest Services upon request. For more information, visit www.flaquarium.org or call 813-273-4000. A Tampa tradition returns select nights now through Dec. 30. Hop on the Pirate Water Taxi for Tampa’s holiday celebration on this 45-minute trip. 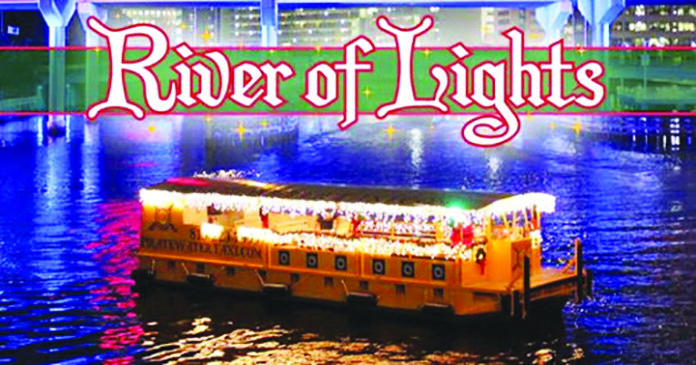 View festive decorations, lighted bridges and other surprises along the Hillsborough River. River of Lights features a whimsical narration, Christmas carolers, hot chocolate and a holiday cookie for each guest. There is no better way to experience the holidays in Tampa. Departure location is from the Tampa Convention Center, 333 S. Franklin St., Tampa. 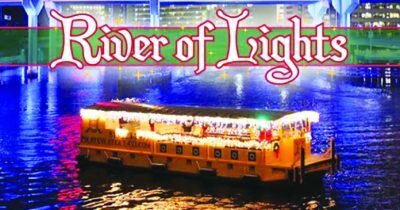 For more information, visit www.piratewatertaxi.com/events/river-of-lights-2018. Experience the joy and wonder of the holiday season every day at Busch Gardens Tampa Bay’s Christmas Town. New this year, guests can enjoy millions of twinkling lights, Christmas shows and Sing-A-Long Train and of course visits with Santa and Rudolph. It will take place every day of the season through Monday, Dec. 31. Christmas Town features extended hours on weekends and additional select dates with even more new experiences, including an all new holiday show, indulgent culinary treats, visits to Rudolph’s Winter Wonderland, nighttime experiences on Florida’s best thrill rides and so much more. Christmas Town is included with any daily admission or annual pass, and is open until 10 p.m. on select dates. The new Brunch with Santa is a Christmas-themed dining experience that’s perfect for the entire family. Adults can enjoy unlimited mimosas or “build your own Bloody Mary” upgrades, and everyone can delight in a menu bursting with holiday delicacies. No Christmas celebration is complete without a visit from St. Nick and guests will have the opportunity to take a photo with Santa as part of their experience. Brunch with Santa is available at the Serengeti Overlook Restaurant on select dates from 10 a.m. to 3 p.m.
Go early with the whole family and make Christmas Town the backdrop for your holiday card. Santa will be awaiting your visit at Santa’s House presented by Coca-Cola. Additional photo opportunities are around every corner: The twinkling light tunnel leading into Stanleyville, all your favorite characters at Rudolph’s Winter Wonderland, Ice and Poinsettia princesses along pathways, larger-than-life Cookie Monster and Elmo nutcracker figures along the Sesame Street Safari of Fun walkway, and playful penguins at the holiday-themed Penguin Point. Guests will discover even more merriment in the Christmas Town Village, celebrating the season in a new location. Greeted by friendly snowmen, guests will be immersed in festive fun along the Gwazi pathway, including merry merchandise and holiday treats. In this enchanting realm, little ones can even take a ride on the fan-favorite Jingle Bell Express miniature train. Indulge in winter whiskey and wine tastings while completing your holiday shopping with gifts from artisans around the world at the Artisan Market at Xcursions and around the park. For a gift that gives all year, shoppers can select a new Busch Gardens Annual Pass with benefits to enjoy exciting events, world-class coasters, and up-close animal encounters. In 2019, Pass Members can look forward to benefits, the park’s 60th anniversary celebration and exclusive ride time for the spring opening of Tigris, Florida’s tallest launch coaster. For complete event information, including dates, times and packages, visit www.ChristmasTown.com.